This thread is for posting your Art Workshop Lessons and Ideas for the story of Jesus as a boy in the Temple. Greek Play? Greek Masks? This is an ancient artform that was used in the Roman amphitheaters built by Herod. More important to our needs, it involves actors who get to 'hide' behind masks, which provides a degree of anonymity which may help some loosen up and share. This lesson has an idea for doing the story drama with a Greek Masked Chorus, but the original script cannot be included here because it is copyrighted material we got from Cokesbury's PowerXpress rotation lesson on Jesus in the Temple. If you don’t wish to purchase this material, you can write your own script that tells the story --->> or use one of the scripts from this drama thread or the storytelling lessons here at rotation.org, and adapt them. We have posted a script in the Drama workshop of this forum which can be adapted to "tell with masks" as Carol's lesson suggests. Note: This workshop was used in 2008. 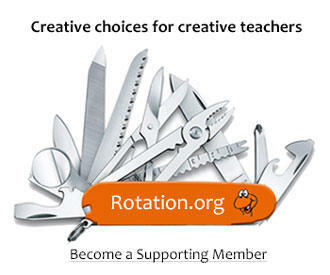 For our re-use of this Rotation in 2013 we have altered this workshop to be strickly drama only (using pre-created masks). It is left here for others who may be interested in this concept of combining an art and a drama workshop. “Talking with the Elders” script (see resources below) Or see this post for an alternate script. Make a copy of the script and cut apart the speaking parts (Prologue part one, Prologue part two, Mary, Joseph, Young Friend, Elder, Jesus). Glue each part on to an index card, creating seven cards. Pre-assemble mask handles by attaching (staple or glue) plates and stir sticks (or tongue depressors) – make one per student. Greet your students warmly, welcoming them to the Art/Drama Workshop. Introduce yourself and any other adults. Have you ever been separated from your parents? Did you know you were lost? What did they say when they found you? How do you think your parents felt when they didn’t know where you were? What are the first four books of the New Testament? Say: The word Gospel means “good news.” Jesus teaches us the good news. 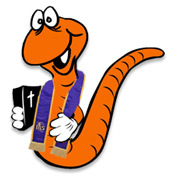 Distribute Bibles. Have everyone find Luke 2:41-52 in his or her Bible. If this is a week early in the Rotation, read the scripture together. Towards the end of the Rotation, ask the students if they can tell you the story. Have them check their Bibles for accuracy. Say: We are going to tell this Bible story as Greek Drama. Ask: Is anyone familiar with a Greek Drama? Say: Greek Drama began in Greece over 2500 years ago. A Greek play started with a prologue – an introductory passage. Then 2 or 3 actors would say lines. The other feature of a Greek play was that there would be a chorus – a group of characters. And everyone had masks. Say: In our Greek Drama we will have 5 actors and a chorus. First we will make masks that represent the characters in this story including the chorus. Ask: Who do you suppose could be characters in our play? Say: We will use Jesus, Mary, Joseph, a Synagogue Elder, A Young Friend, and Bible-times people in the crowd who will be the chorus in the play. You will hold the masks on a stick in front of your face as you read the part of the character. Say: Let’s begin with making our masks. Show them the plates that will be the masks and describe how they may use various items to create the faces of the character they selected. Why do you think Jesus stayed behind after the Passover festival to spend more time in the temple? How does having God in your life help you feel not lost? How do you feel the presence of God in your life? As you get older and earn more responsibility and independence, like Jesus did in the story, what will you do to learn more about your role as a child of God? Give each character their speaking part on the 3x5 cards. Begin with reading the prologue. Then say the name of each character when it is his or her turn to speak. Have the chorus say, “Where is Jesus?” after a character finishes speaking and takes the mask away from his or her face. Ask: How did our Greek Play help you understand the key bible verse? Say: Jesus knew that as he matured he would still be responsible and obedient to his earthly parents, Mary and Joseph, and would also devote time learning about his special role as God’s Son. The source of the idea for this workshop and the script for the play came from Sticker, LeeDell. “Talking with the Elders” PowerXpress! Bible Experience Stations by Abingdon Press 2001. Copyright 2008 First United Methodist Church, Ann Arbor, MI. Permission to copy materials granted for non-commercial use provided credit is given and all cited references remain with this material. Name that the story is found in the New Testament. For 3rd grade and up: Locate the story in Luke. Identify the four Gospels. 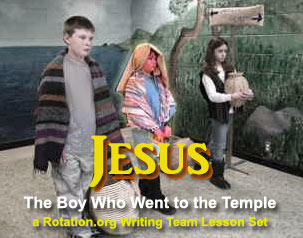 Retell the story of Jesus in the Temple as a young boy, in his/her own words. Recognize that by staying behind in the Temple, Jesus is placing a high priority on learning about God. Discover that one way to learn about God is to worship with others in community. Consider that we each have talents and gifts from God, and conclude that it is our task to discover our unique gifts and to put them to use by serving others to the Glory of God. Bookmark the leader’s Bible at the very start of the New Testament & at Luke 2:40. For 3rd grade and up: Distribute Bibles around the seats at the tables. For larger groups create two containers of each color. Place a marble or two in each color of paint. Leave one marble “clean” – i.e., not in paint. For younger students, pre-fold for each student two sheets of paper for book pages and tuck one sheet inside the other. (Refer to web site instructions.) Punch two holes through all layers ¼ inch from folded edge. Set these aside. Greet your students warmly, welcoming them to the Art Workshop. Ask the Shepherd to take care of attendance/nametags while you are starting your lesson. Pick up the leader’s Bible. Say: Let’s start off with getting to know each other by everyone taking a turn at saying your name and something that you’ve had to search for recently; maybe a new classroom, or a new friend, or something you’ve misplaced. Say: In our Bible story today we will find people searching. Mary and Joseph are searching for Jesus, who is at the time, 12 years old. Mary and Joseph think that Jesus is lost. They can’t find him anywhere! Meanwhile, Jesus is searching for something entirely different. Jesus is searching for something that all of us look for! If we listen carefully we’ll learn an important truth that will help us on our search. First let’s start with prayer. Say: At the end of the prayer, I will allow a time when you can pray silently for one need you have, and for one thing for which you are thankful to God. Then we’ll use the Lord’s Prayer as the ending to our prayer. Let’s talk to God! Do: A suggested prayer: “Dear God, Thank you for everyone that is here today. Be with those who could not be here. We are thankful for the chance to learn about ways that you’d like us to grow and to become wise. Help us to figure out the special blessings that you have given us, that we might be able to use them for your glory. Lord, now you will hear each of us pray silently, sharing a need and a thankful… (Don’t rush the silence!) End with everyone joining in on the Lord’s Prayer. Amen. Ask: If we want to read a story in the Bible about Jesus, where would we find it – in the Old Testament or the New Testament of the Bible? Do: As you say the next words, show the two portions of the Bible. Say: The Bible contains two Testaments or two major sections – the Old Testament and the New Testament. The Old Testament was the Bible that Jesus had when he was your age. The New Testament includes stories about Jesus. Since our story is about Jesus we find in the New Testament, in the Gospel of Luke. Listen as I read from a story Bible. Do: Read them the story on pages 254 -258 of The Praise Bible. Show the pictures as you read. Say: The word “gospel” means good news. Stories about how Jesus came to live, as God’s son among people – to grow just like us – is good news! Do: Make sure that everyone has access to a Bible. Have everyone find Luke 2:41. Since these students visit later in the Rotation, ask the students to tell you the story. If necessary, check their Bibles for details. Say: A Temple is what we would call a church. It was the gathering place for all people who wanted to worship God, and for those who wanted to learn to know God. Say: Let me read this verse from the Bible. See if this helps us figure out what Jesus is searching for. Say: Jesus was listening and talking to the Bible teachers. He was looking to learn about God! He was searching to discover who God was and what God wanted him to do! Say: What does God want from you? Let’s say that you really like to help people; it gives you a warm feeling deep inside when you can assist someone. That is a gift from God! You are a helper! What does God want from you? God want you to use your helper-ability, to do lots of helping! We say that God blesses us. God gives everyone skills, and wants us to use our skills. Say: I would like you to be thinking of what abilities God has given you. We’ll be making a special book where we can list those skills, or draw pictures of our special abilities; abilities that we can share with others. 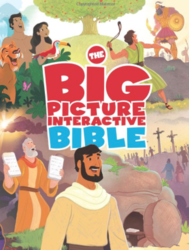 Our book will have a very interesting cover that will help us to remember our Bible story. We are going to be creating a marble painting. 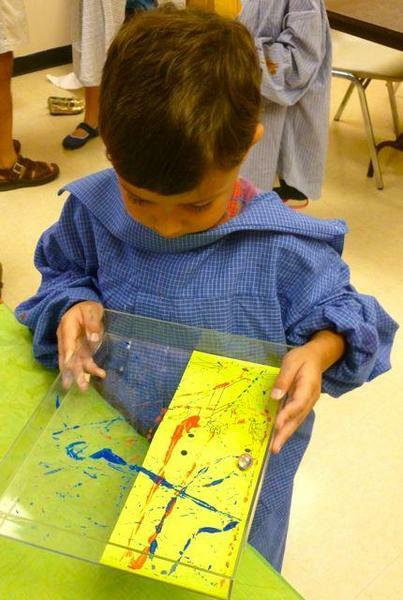 Say: As a marble with paint on it rolls inside of this tray, it will create random trails of color. It’s like the marble is Mary and Joseph looking for Jesus. He’s not there. So let’s look in this corner. [Roll the marble to another corner.] Here’s not there. Let’s look over here. Or perhaps the marble is me and I am looking for my special talents. Hmm, am I am helper? [Roll the marble.] Or am I good with music? Or am I good at making things? Say: So our marble paintings will become the cover of our book of talents. Let’s start working on our book covers. We will have to take turns making our marble paintings. While you are waiting you can create book pages. Say: I am passing out the paper that we will use to paint on with a marble. You will notice that this paper is not blank! It is a connect-the-dots puzzle. First, turn the paper over and write your name on the back. Then take your pencil and starting at the number 1, which is in the middle of the page, draw a line to connect all of the numbers. Do: Distribute a pencil and a dot-to-dot paper to each student. Keep on talking as students work! Say: In order to figure out what our special talents from God are, it takes some searching. It takes some study. It can be like a puzzle. Say: God gives us gifts because God loves us! God loves us so much that his very best gift was to send his son Jesus to live on earth, to grow and be human just like us. God gives us each special gifts. Your gifts are different than my gifts. God blesses us each in different ways, because God needs us to be his hands and his feet in this world. Do: Ask one student to help you demonstrate the painting process to the rest of the class. Inform the Shepherd that you will need them to take charge of this process. Demonstrate the process using the “clean” marble. Offer the student a painting shirt. 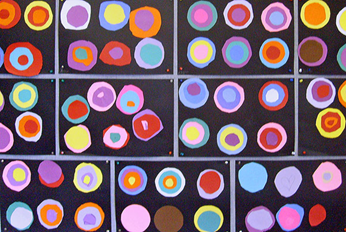 Have student place their paper in a tray (Jesus dot-to-dot side up) and using one marble at a time, roll on color. When done with that color, place the marble back into the appropriate paint container. Wipe their fingers! Choose another color marble to paint with. When done, lay their painting aside and use wet wipes to clean their fingers. Have students take turns in groups to paint. If there is an extra helper in the room, have them use the hair dryer to speed the paint drying. Otherwise the Shepherd can do this task later. Perhaps do this out in the hall to reduce the noise in the classroom. Do: Leave the Shepherd in charge of the painting. Return your focus to the rest of the class. Do: Distribute a set of pre-punched book pages to each student. Do: Show them how the book pages will be oriented – with the punched holes at the top. Distribute colored pencils. Encourage them to write and/or draw their gifts from God. They may want to draw themselves sharing their gift. Questions to ask to help in identifying gifts: What do you like to do? Do you like to tell people “good job?” You have the gift of encouragement. Do you like to teach people new things? -- You are a teacher. Do you always like to be first or the best? – You are a leader. Do you keep your room tidy and neat? – You have the gift of being organized. Do you like to sing? – You have the gift of making music. Do you like to share your toys? – You are generous. Students may choose to list/illustrate a gift that they would like to develop. Perhaps they could list/draw things that would help them to achieve this. Do: Ask each student, individually to tell you about a gift they have identified. Say: By listening and by asking questions at the Temple, Jesus was learning about God and about his relationship with God. He was also amazing those around him with his answers and understanding. He was revealing his talents and gifts! Ask: Do you suppose, as a 12 year old, that Jesus understood what his role in life would be – that he was the Messiah that everyone had been waiting for? Say: The Bible doesn’t tell us the answer to this question. We don’t know for sure what Jesus thought about his calling in life. From this story we do know that he considered it important that he spend time in what he called “his father’s house.” The Temple was a place of worship and learning just like our church. Jesus felt that it was important to talk to the teachers to learn as much as he could and to share his knowledge – to teach others about God. Ask: How do we learn from church? How do you feel about being at church – do you feel that you “belong” here? Say: One reason we come to church is because we need to be able to be a part of a group of people who share our same experiences. We would call this “experiencing community.” These other people here at church can help us to find God in our lives. Do: Fold the cover and using the hole-punched pages as a guide, use a pencil to mark where the two holes should go on the cover. Punch the holes in the cover. Assemble all of the pages and the cover. Take a rubber band and poke it through one of the holes. (Use a pencil if needed.) Place the stick on the cover (with the dot-to-dot) and encircle one end of the rubber band around the stick. Thread the other end of the rubber band through the other hole and around the other end of the stick. Say: Jesus felt that he belonged at the Temple, learning about God and teaching others about God. The Bible tells us that after Jesus was found in the Temple, that he went home with his parents. Jesus was 12 in this story so he had lots of growing to do – both growing taller and wiser and in his knowledge about God. Do: Refer to the easel. Read the key verse. Say: This week, may you become stronger and wiser, and may God bless you. Thomas, Mack. The Praise Bible. Colorado Springs: Waterbrook Press, 1998. Copyright 2013 First United Methodist Church, Ann Arbor, MI. Permission to copy materials granted for non-commercial use provided credit is given and all cited references remain with this material. Hulbert, Carol, et al. "Jesus as a Young Boy in the Temple – Art Workshop." Sept./13. Place URL where lesson found inside angle brackets<>. Additional art supplies may be needed by the older children. Say: The Bible says that Jesus grew in wisdom... in stature... in favor with God... and in favor with people... four different ways of growing up. Today we are going to make some art to help us think about what this means. Here is an example of what we'll be working on. Ask: Do you notice how many circles we have? Say: Four! right! They are each similar but different... Look how they work together to make something beautiful. 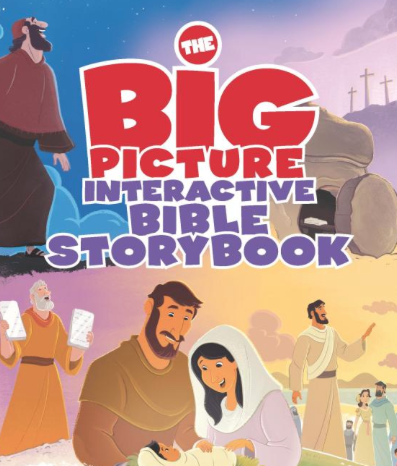 Little kids can spend their time tracing, cutting and gluing while discussing the story of boy Jesus. Encourage exploration with wondering questions or ideas but remember, children will likely work through their responses in the art… You will not likely receive verbal answers! Don’t be discouraged, continue to offer a dialogue of questions throughout the process. Ask: What might growing in wisdom look like? Which way to grow is the most important? Which is most beautiful? I wonder why? Resist the urge to do the work for the students (especially the younger ones). Remember, the physical process is often just as important (if not more so) as the final product. Show the children how to use the scissors and glue appropriately, but don’t cut or glue for them!! This is not just a craft time - this is worship art, and the children need to learn not to rush through to an end result! Ask: I wonder which of the four ways that Jesus grew was the most important? Glue the circle onto the black paper. 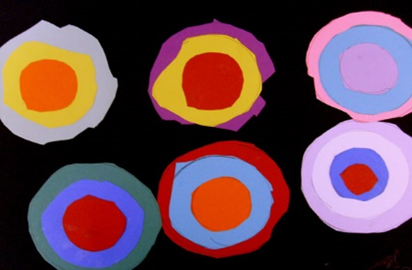 (If the child has time they can make more than one set of circles… maybe one to represent how they will grow and the other to focus on Jesus…. Are they similar? Should they be? Why or why not? When the first circle is cut, decorated and glued do the same for the next but use a smaller plastic cup and smaller pieces of paper. Glue the medium circles to the large circle. Talk about contrasting colors/designs. How are these things different? What does favor with God mean? What about favor with people? 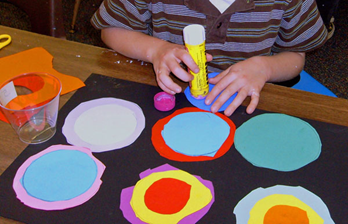 Repeat steps and encourage the kids to use scraps of paper from steps one and two to make smaller and smaller circles. When finished the children can label the circles if they wish with Wisdom, Stature, Favor with God, Favor with people. Finish up with a sharing and de-briefing time. Ask: What surprised you about this story? Is growing up hard work? What might these circles remind us of? Did you see anything new today? Students construct a Model of the Temple where Jesus worshiped, learned, and taught. The Temple resource comes from the Rotation.org Writing Team's Computer Workshop lesson -used here with permission. 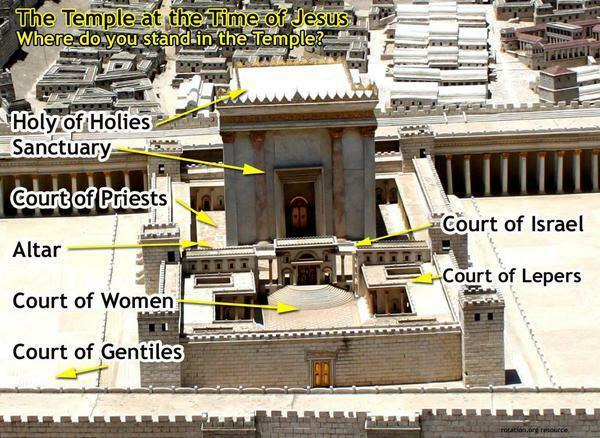 That lesson includes a REFLECTION activity titled, "Where do you stand in the Temple?" (How close to God do you feel? Which court are you in? etc.) The reflection idea is based on tradition of areas in the Temple that some people were not allowed to go to, or needed to be of higher status, and the idea that they had back then that God was in the inner sanctum of the Temple, so you wanted to get close to it if you could.